Born on January 29, 1920 to Ole and Olephine Strand, the youngest of 9 children he grew up on the family farm outside of St. Peter, Minnesota. Married Ruth Henry of St. Paul, Minnesota at the age of 23. Sherman was a veteran of World War II and served as a doctor at the Navy Air Weapons Station in China Lake, California. He later served as a physician in the Naval Reserve for eight additional years. Dr. Strand was a prominent ear, nose and throat physician and plastic surgion. who practiced in Santa Monica, California for many years until his retirement in 1978. In his later years, his primary focus was on plastic surgery. Dr. Strand held many prestigious medical positions, the Santa Monica UCLA Hospital's Chief of Staff, head of surgery at St. John's Hospital in Santa Monica, and clinical instructor at USC and UCLA medical schools. During his 31 years of retirement, Dr. Strand pursued his passion for the arts at the College of the Desert and became an accomplished artist in multi mediums. 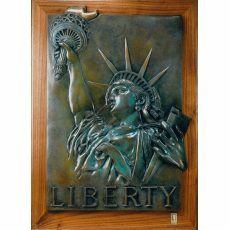 Strand was commissioned by the Statue of Liberty-Ellis Island Foundation to sculpture the signature piece “Liberty” in the LIBERTY Commemorative Bas-Relief Series. “Liberty” was created for the 1976 Bicentennial Celebration, which helped raise funds for the restoration of the Statue of Liberty. His sculptures of the human form are part of many major collections in the United States.